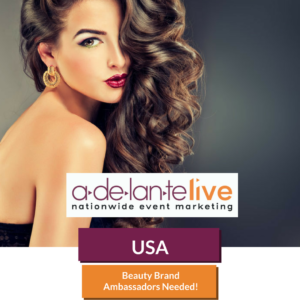 A major beauty brand is seeking outgoing brand ambassadors with knowledge and interest in beauty and hair care products to demonstrate an amazing hair care product line at a well known retailer. Please review all details below and follow the instructions on how to submit your availability and interest in this position. Brand ambassador with an energetic spirit and professional and helpful demeanor. Confident in discussing beauty products and passionate about beauty and hair care products. Should be comfortable with multiple message points and working in a fast paced environment. Comfortable with retention of product benefits and messaging and translating information to consumers. Have neatly applied makeup (if applicable) and neatly styled hair. No facial piercings or visible tattoos. BE PRESENTABLE AND PERSONABLE. Talent must have working cell phone, internet access and digital camera or cell phone camera to bring to event. NOTE: All talent booked for Adelante Live Inc. events will be considered W2 employees of Adelante Live Event Services and will be subject to all federal, state, and local withholding taxes and applicable laws. For immediate consideration, please REGISTER by clicking the REGISTER NOW! Button below. After you’ve registered, click on SEARCH to search by Metro, State or Zip Code. Please APPLY to all locations and positions you are willing to execute. If you are already a registered contracted talent of Adelante Live, please Log in to your profile at www.adelantelive.com, then click on SEARCH to search by Metro, State or Zip Code. Please APPLY to all locations and positions you are willing to execute.